In this experiment we had to build a boat out of aluminum foil, 2 tooth picks, 2 marshmallows and 15cm of tape and we had to count how many pennies we could place on the boat before it sank. 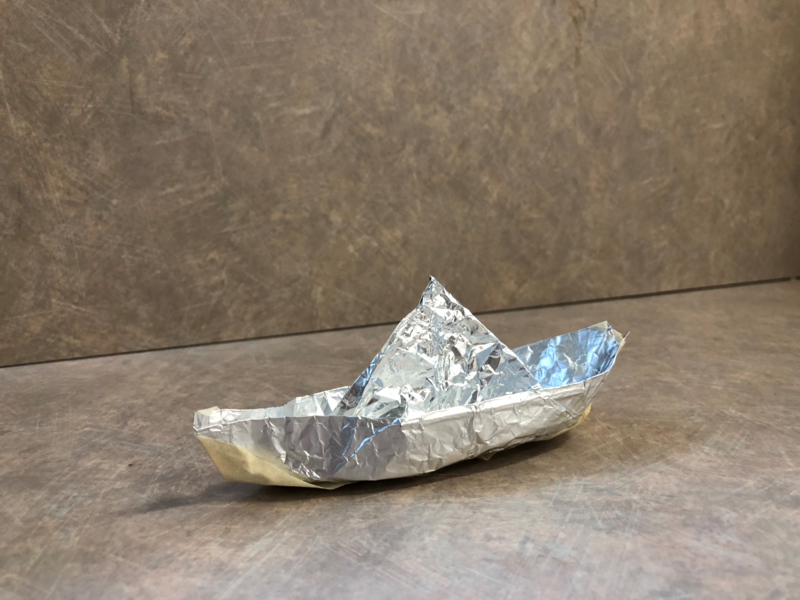 We tried to make our boat fancy and we did some origami hoping that a paper boat reference would help us in the process of constructing it. Our hypothesis was that if we create a stable enough boat then the pennies we place gently into the boat will not cause the boat to sink because of the stability and shape of the boat that we constructed. In conclusion our boat contained 20 pennies before it sank, we placed them carefully and equally distributed them across our boat so that one side wouldn’t tip over causing it to sink, we could have improved our experiment by testing different materials and how we constructed it, our hypothesis was supported because we mentioned that the pennies would be able to be placed on the boat without it sinking and it didn’t sink with adding one penny. An error that could have been made during our experiment is how we placed the pennies on the boat because like one of the other groups they placed to many pennies on one side of the boat which made it an uneven causing one corner to sink into the water which the water then leaked into the boat, causing it to sink.